Western Governments keeps on making such laws which shows their Hatred towards Islam. Islam is fastest growing religion in Western Countries which fears Western Governments. Few Months Back French Parliament approved the law of banning the Hijab In France. The Implementation on Hijab Ban Law is starting from today 11th April 2011. From today If any Women will Wear Hijab In France she will arrested as well as fined. Many French Muslim Women has announced that they will continue to wear Hijab because its their Human right. 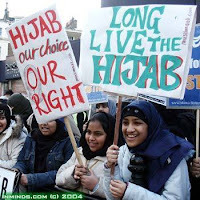 Muslims all around the World has condemned the French Ban on Hijab and called it a step against Human Rights. French Government is also thinking to take different steps to stop popularity of Islam in France. Increasing Muslim Population In France is also worrying French Officials.